I’ve always enjoyed running on tracks, and I’ve always been fascinated by them. Maybe that makes me an eccentric. After all, I have the impression that most people, if they ever think about their neighborhood running track at all, probably view it as a rather dull and obligatory use of real estate, little more than ornamental window dressing for a football or soccer field. And most of the time, that running track probably does look abandoned, with with only a few walkers or joggers shuffling around in slow circuits, accumulating mindlessly identical laps. That’s not how I feel. Being on or near a track fires my imagination, as it piques my curiosity. Far from being uniform and dull, I find that individual tracks have their own personalities, as well as annoying or lovable quirks of site design. I make it a habit to look for these quirks, and to learn something about every track I visit. But perhaps the most interesting aspects of running tracks are the mysteries hidden in plain sight, by which I mean the mathematics governing the design and construction of the running surface itself. What seem to be simple, inevitable layouts turn out to be anything but simple. Trying to answer a basic question, such as, “how far around?” can turn into a deep discussion of geometry, history, and culture. And then there are the odd hieroglyphics scattered all over the track’s surface. Far from being a dead language, these, too, tell of exotic events and performances, of athletes striving, setting records, and becoming legends. I don’t mind those people who choose to zone out on tracks, completing their fitness circuits while listening to music or chatting with friends. But for me, the unexamined track is not worth running, and so I try to pay attention. What follows are a few things that I’ve learned about tracks that I think are worth knowing. I hope that whether you’re a jogger, a serious runner, or a spectator, these facts add to your appreciation of the tracks in your life. How long is a 400m track? Interesting question! These days, most outdoor running tracks are designed so that a runner making one complete circuit of the track while staying in Lane 1 covers exactly 400m. But this apparently self-evident fact about a 400m track is actually a complicated business. Let’s consider a 400m track that has been constructed according to International guidelines. 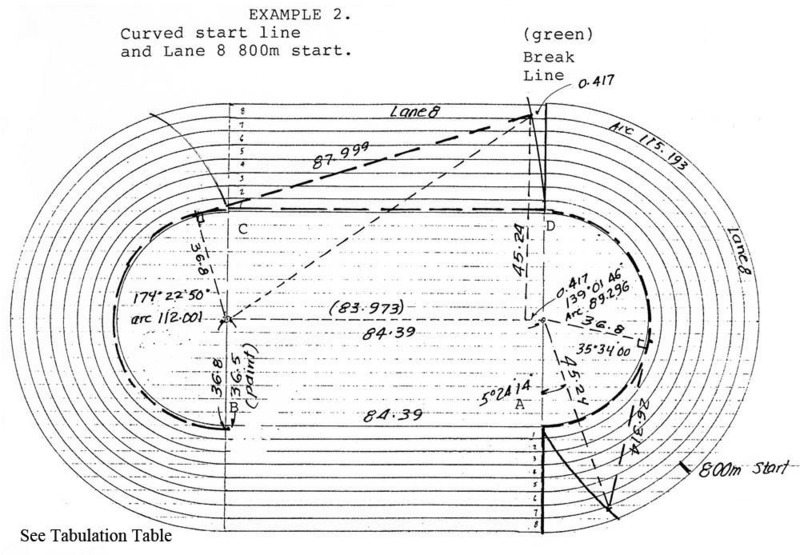 These guidelines specify that the length of each straight segment of the track (“the straights”) shall be 84.39 meters, and the bends at either end of the track (“the curves”) be semi-circular arcs with a radius of 36.50 meters. On such a track, the actual distance of one lap, measured along the inside of Lane 1, is not 400 meters; it is 398.116 meters. Why is that? So a 400m track is designed so that the length of the measure line in Lane 1 is exactly 400 meters. And what of the other lanes? Although a very few tracks have curbs in lanes other than Lane 1 (Franklin Field at Penn comes to mind), for the vast majority of tracks, Lanes 2 and out have no rail, so they are all measured 20 cm out from the inside of the lane. While the length of the straights is the same for all lanes, as one moves outward from Lane 1, the radius of the curves increases and so, too, does the length of the measure line. You might wonder why we stop at nine lanes. It’s because the IAAF technical manual for facilities states that nine is the maximum number of lanes for a standard track. The reason given is that, as the radius increases, the curve becomes more and more gentle, giving a theoretical advantage to runners in the outside lanes. Like so many other track guidelines, there is something annoyingly arbitrary about limiting tracks to nine lanes. Or, if “arbitrary” seems too harsh a word, say instead that the IAAF had to establish a limit for the number of lanes, as well as many other things, and chose nine lanes as a reasonable compromise. If you have run on different tracks, you have probably noticed that some tracks feel “narrow,” with long straights and shorter, tighter turns, while some feel “wide,” with shorter straights and long, sweeping turns. This variation is understandable when we realize that tracks are constructed around fields of different shapes, or, indeed, to fit a particular site and the space available. In the previous section, we used the IAAF standard dimensions: straights of 84.39m, and curves with a radius of 36.50 meters. In its technical manual, The IAAF lists three other permissible non-standard arrangements, in which the curves are constructed using multiple arcs with different radii. These “double bend” tracks are a concession to facilities that are used for other sports, such as soccer, American football, and rugby, where the dimensions of the playing field do not easily accommodate the dimensions of the standard track. Here’s one example, a double-bend 400m track sized to accommodate an American football field. Each curve is constructed from three separate arcs with radii of 27.082m, 40.022m, and 27.082m. This results in curves that are 102.744m long, along the measure line of Lane 1, and straights that are 97.256m long – almost 13m longer than the straights of a standard track. Speaking as a miler who has run on such tracks and faded badly in those last 13 meters, I can say from personal experience that starting a kick when you round into the home straight, and then realizing that straight is 15% longer than what you’re expecting is extremely aggravating. Thus, I’ve developed a prejudice against tracks that impose football-friendly dimensions. A wider radius allows greater flexibility in placing fields, especially soccer pitches, within the track oval. Occasionally, one will come across a track with straights longer than 100m and very tight turns. In my opinion, it’s unpleasant to run far or fast on such a track. On the other hand, if a race has no turns, a longer straight is a good thing. As a historical note, the dimensions of the original Olympic stadium (stadion) in Olympia, Greece, site of the ancient Olympic Games, was 212.54 meters long and 30-34 meters wide. Races started at the East end of the stadium and finished 192.27 meters away at the West end. (According to one source, “the distance [of 192.27 meters] was fixed in agreement with an Heraklion myth, [in which] the hero measured out the distance of the first race by placing one foot in front of the other 600 times.”) Had races covered a full lap or multiple laps, the narrowness of the stadium for turns would have been an issue, but apparently there were no such races contested. As a further historical note, while it was not used for any races, the site of the ancient stadium in Olympia WAS used for the Shot Put competition in the 2004 Olympic Games, hosted by Athens. The point is that long and narrow tracks exist in the wild, and whatever one thinks about doing workouts on such a track, a runner with an interest in track construction might want to enjoy, rather than disparage, their quirkiness. And then there are the asymmetric tracks. There is an ancient thread on LetsRun (What is the strangest track you know of) that invites readers to post about unusual tracks – both indoor and outdoor. Some of the examples — presumably solutions to problems of squeezing tracks into limited areas — are really odd, and make non-standard tracks like the equal quadrant version look like shining examples of order and rationality by comparison. Consider, for just one example, Wallace Field on the campus of Seattle Pacific University: Wedged into a narrow area between W. Nickerson St. and the Fremont Cut, which connects Puget Sound to Lake Union, the track has four lanes for most of its length, but narrows to two lanes for a while. It also includes a right-hand turn! Let’s leave the world of weird tracks behind, and return to so-called “standard” tracks. The 400-meter standard is a relatively recent phenomenon, at least in the United States. When I was growing up, most high school tracks in the United States were 440 yards, not 400 meters. We competed at “imperial,” rather than “metric,” distances: the “four-forty,” the “eight-eighty,” and so on. On an imperial track, one mile was precisely four laps. Nowadays, most tracks are 400m, which is only 437.445 yards. On a metric track, a mile is four laps plus another 9.34 meters. In my home state of Massachusetts, public high school runners still compete at the Mile and Two Mile, requiring start lines approximately 10 and 20 yards, respectively, before the common finish. Other states contest the 1600 and 3200 (4 laps and 8 laps), or in some cases, the 1500 and 3000 (3.75 and 7.5 laps). For some reason, private schools in New England have gone metric with the 1500 and 3000, and still hold the 300m hurdles instead of the 400m hurdles. Go figure. Anyway, it’s increasingly rare to find genuine 440-yard tracks, although they do exist. Until they demolished the school, the old Newton North had a 440 yard track. A similar situation exists indoors. Standard indoor tracks are 200m, but the Harvard indoor track is 220-yards – 8 laps, exactly, to the mile. Years ago, there used to be more variety in the length of outdoor tracks, even for meets like the modern Olympics. For one example, in the early 20th century 500m tracks were not uncommon. In his autobiography, No Bugles, No Drums, 3-time Olympic gold medalist Peter Snell recounts winning an international 800m on a 500m track, so such tracks must have existed until the late 1950s, at least. For another example, in 1952 Emil Zatopek set the World Record for 20,000 meters (and 10 miles and 1 Hour) on a track that was, oddly, only 363.78 meters long. Even today, sometime tracks are sized to fit in whatever open space is available, leading to odd and non-standard lengths and dimensions. See, for example, the Goss Track at the Fenn School, one of the sites profiled in my series, Field Guide to North American Tracks. A running track is much more than a flat, lifeless oval, it is a place of mysteries and stories, if you know where to look and how to listen. If you, like me, find yourself doing daily runs on tracks instead of on trails, try to notice all the lines and markings and wonder about them. Why is the finish line placed where it is? Why are the relay zones marked the way they are? Does the curved line for the start of the distance races guarantee a fair start for all competitors? If you are lucky enough to run at a track that has a steeplechase pit, where is the start of the race and why did the powers that be settle on 3000m as the length of the race? (In the early days of the Olympics, other distances were contested, but that’s a subject for another day.) If you see marks that you’ve never seen before, ask yourself who put them there and why. Or don’t. It’s up to you. But I encourage everyone to pause the next time you step on a track and take a few moments to appreciate these secular sanctuaries of running (and jumping and throwing). Want to read even more about tracks? You might like my essay about why, like life the 200m is not fair. This entry was posted in Field Guide to Tracks, Records & Statistics, Track and tagged 400m track dimensions, standard running track, Track dimensions, track measurements. Bookmark the permalink. I’m wondering if you could answer a question I have. Has there ever been a one mile track? Once around = one mile. An elderly gentleman told me how he had run a one mile race on a one mile dirt track once. I’ve tried to search for this, but I haven’t found an answer. Thanks in advance. Hi Deanna, thanks for reading and commenting. I am not aware of any one-mile tracks built for humans. If you spoke with someone who ran on a one-mile dirt track, I feel almost certain it was originally intended for horse racing, or possibly dirt bike racing. One mile is eight furlongs, and a quick Internet search suggests there have been numerous horse racing tracks of about that distance or slightly longer. Not far from where I live, the Suffolks downs track is still active, and I believe it is 1 /18 mile (but I haven’t looked it up). For quite a few years, I ran a race in Rhode Island that finished on a dirt dog track, but that was much shorter — perhaps 250 meters. The point is that I’ve run in events where humans ran on tracks typically used by other animals. Your question also makes me think about grass tracks, and I should really write about them some day, too. Thanks again for the interesting discussion! Interesting article! A number of years ago my father studied this issue and found that even with the staggered start, the standard oval track doesn’t provide equal access to runners. He actually filed a patent on a new track design, but thus far no place has gotten on board with it. Despite the “staggered start” positioning that equalizes the distance run by each competitor, a serious lack of parity between competitors in track events remains. This lack of parity stems from the “centrifugal effect.” An athlete running a curve must expend some of his or her thrust force to combat the centrifugal force, leaving less thrust force available for increasing or maintaining speed. Consequently, he or she can run faster on a straight course than on a curve. More impor­tantly, he or she can run faster in an outer (less curved) lane than in an inner lane. The importance of this effect is indicated by the fact that Tommy Smith’s world record time for the 50 conventional 200 m, which he set running in Lane 3 , is 0.43 sec slower than his world record time for a 200 m run in a straight track.